The all-new Fujifilm X-T30 digital mirrorless camera will officially arrive in the Philippines on March 20. However, the company has already revealed the local pricing and opened the pre-orders for the latest X-Series camera. Pricing for the new X-T30 is at P52,990 for body only and P75,990 with the Xf18-55mm kit. Fujifilm offers up to P20,399 worth of freebies if you pre-order its latest mirrorless shooter. The free bundle includes an NP-W126S battery (P3,500), an X Shutter Button & X Hot Shoe (P2,000), and Lens Pouch (P300). Also part of the pre-order package are photography and videography workshop (P7,000) courtesy of Shoot! and six months extended warranty (P7,599). Fujifilm will also give you big discounts on select F2 lenses when you pre-order the X-T30. Get the XF23mmF2 (original price: P24,990), XF35mmF2 (original price: P21,990), and XF50mmF2 (original price: P25,990) for only P12,000 each. 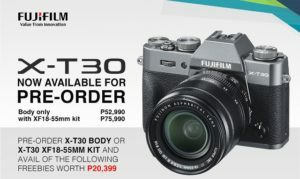 You can pre-order the Fujifilm X-T30 and avail of the special offers above starting February 16 until March 19, 2019 in official Fujifilm stores and authorized retailers nationwide.